Something to Remember is a compilation album by American singer Madonna, released by Maverick Records on November 3, 1995. The album was conceived after a controversial period in Madonna's career, when many critics had speculated that her career had declined. It compiles ballads spanning over a decade of her career, including a reworked version of "Love Don't Live Here Anymore" and three new songs: "You'll See", "One More Chance" and a cover of Marvin Gaye's "I Want You". The album also features previously released singles that had never been included on a Madonna album, "I'll Remember" and "This Used to Be My Playground", and altogether provided a softer image for the singer during a critical period in her career. For producing the new songs for the album, Madonna worked with David Foster and Nellee Hooper, the former known for his work with such artists as Barbra Streisand and Olivia Newton-John. Madonna stated that the concept for the album was to make fans and critics alike remember her music contributions rather than her media controversies. Something to Remember was well received by music critics who were impressed with Madonna's vocals and the album's cohesiveness. It was also a commercial success, topping charts in Australia, Austria, Finland, and Italy, and peaking within top ten elsewhere. In the United States, it reached number six on the Billboard 200 and was certified three times platinum by the Recording Industry Association of America (RIAA) for shipments of three million units. Worldwide, Something to Remember has sold over ten million copies. Four singles and one promotional single were released to promote the album. Originally intended as the album's lead single, "I Want You" was released as the promotional single preceding the album, with a music video directed by Earle Sebastian. "You'll See" was released as the album's first single on October 23, 1995, accompanied by a Spanish version titled "Verás" and a music video directed by Michael Haussman. The song peaked at number six on the Billboard Hot 100, while reaching the top five in Austria, Canada, Finland, Italy and the United Kingdom. "Oh Father", "One More Chance" and "Love Don't Live Here Anymore" were released as the follow up singles, but gained little commercial response; the latter received a music video directed by Jean-Baptiste Mondino. 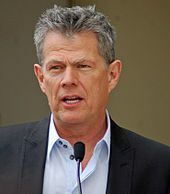 David Foster was chosen to co-write and co-produce new material for the album. So much controversy has swirled around my career this past decade that very little attention ever gets paid to my music. The songs are all but forgotten. While I have no regrets regarding the choices I've made artistically, I've learned to appreciate the idea of doing things in a simpler way. So without a lot of fanfare, without any distractions, I present to you this collection of ballads. Some are old, some are new. All of them are from my heart. The new material for the album saw her collaboration with a well-known producer David Foster, who had worked with the likes of Barbra Streisand, Al Jarreau and Earth, Wind & Fire. Foster recalled the first time Madonna's publicist Liz Rosenberg contacting him for a dinner with the singer: "When Madonna first called, I was a little surprised—my music isn't really hip enough for her—but I guess her camp thought we should meet, and I got a call from Liz Rosenberg, the PR maven who has been with Madonna from the beginning." Not long after the dinner, Madonna and Foster began the recording session in his Malibu studio. During the album conception, Madonna was also asked by her Bedtime Stories producer Nellee Hooper to collaborate with British trip hop group Massive Attack for a Marvin Gaye tribute album. Previously, the band had offered the collaboration to several artists, including Chaka Khan who rejected it. Madonna and Massive Attack covered Gaye's 1976 hit "I Want You", which finished among the new material for Something to Remember and was also included on the Inner City Blues: The Music of Marvin Gaye released by Motown Records. "She had an amazing work ethic. She was on time every day and was really co-producing the songs with me. A lot of artists want to produce just because they can, and they don't do a thing for the credit, which I really hate. But Madonna worked as hard as any producer I know ... I liked the whole experience of working with her—the punctuality, the professionalism, and the sexiness." —David Foster, about working with Madonna. The first track selected for use on the compilation album was "Love Don't Live Here Anymore" from Like a Virgin (1984). The track was reworked by producer David Reitzas and features a different composition from the 1984 version. Madonna also included two soundtrack singles which had never been featured on her own album, "This Used to Be My Playground" from the 1992 film A League of Their Own and "I'll Remember" from the 1994 film With Honors. Other previously released material selected for the compilation were "Crazy for You" from Vision Quest (1985), "Live to Tell" from True Blue (1986), "Oh Father" from Like a Prayer (1989), "Something to Remember" from I'm Breathless (1990), "Rain" from Erotica (1992), as well as "Take a Bow" and "Forbidden Love", both from Bedtime Stories (1994). Two tracks on the compilation, "Crazy for You" and "Live to Tell", were overlapping with her first greatest hits album, The Immaculate Collection (1990). According to Rikky Rooksby, the author of The Complete Guide to the Music of Madonna, the song selection creates a soft atmosphere, the music is downbeat and "emotionally introverted" with mellow vibes throughout. Madonna's recording session with David Foster resulted two new songs to the final track listing, "You'll See" and "One More Chance". Foster commented: "At the end of the day, the songs we did were not particularly impressive, though one of them, "You'll See", was really neat. Madonna had written a great lyric (You think that I can't live without your love / You'll see) and I thought my music was great." "You'll See" is a low bass track featuring wind chimes and a Spanish guitar. Throughout the chord changes progression to give Madonna's vocals dominance in the song, and after a minute the percussion starts with a tremolo guitar added later. Lyrically, the song talks of independence after the end of a love affair stating that Madonna will go onto greater things. Madonna was asked whether the track was about revenge to which she replied "No, it's about empowering yourself." Madonna later recorded the Spanish version of "You'll See" in Gloria and Emilio Estefan's studio in Miami. Titled "Verás", the song was adapted into Spanish by Paz Martinez. The next original song, "One More Chance", is an acoustic ballad, whose lyrics are about attempting to win a lost lover back. The song was inspired by Madonna's real life experience, but she wrote it from the opposite point of view. Its composition has an organic arrangement, devoid of any synths and sequencing, and only based on guitars with plenty of chord changes and subdued strings. Nellee Hooper produced another new addition to the compilation, the cover version of Marvin Gaye's "I Want You". After Madonna accepted Hooper's suggestion to collaborate with Massive Attack, the band sent Madonna the music of the song first. Robert "3D" Del Naja, one of the band members, subsequently went to New York with Hooper and worked in the studio for two days. Del Naja said, "I think the really cool thing about it was the fact that [Madonna] sang it so beautifully. There was no special effects, no messing around—it was just in there singing it with a lot of passion and soul." The opening track of the compilation, "I Want You" starts with a long introduction featuring a hip-hop drum beat with emphasis on the bass section of the instrumental alongside a semi-tonal string figure. The second verse features a harp and a repeating drum loop accompanied with a telephone style bleeping sound. Madonna's vocals at times are accompanied by spoken passages with her overall vocals dominating the track, with lyrics discussing a man that no longer wants her, while she is determined to change his mind. The compilation closes with the orchestral version of "I Want You" in which the original drum track, bass and percussion are removed. The version starts slower with Madonna's vocals entering with a low string bass line only, gradually more string arrangements are added with harp and brass featured in the background of the mix. A moment towards the end of the track hears her voice with no accompaniment creating a "dramatic" theme, and overall the version features around 20 seconds less than the original. The album's cover art was shot by Mario Testino (pictured). The album's artwork was taken from a shoot by fashion photographer Mario Testino, in which Madonna modelled Versace clothes for their upcoming Fall/Winter 1995 campaign. Subsequently, other images taken from the shoot appeared in fashion magazines, such as Vanity Fair and Vogue Italia. The packaging included with the release showed Madonna looking "deliciously cosmopolitan" as she wore a tight-fit white cocktail attire, while the back cover artwork is predominantly more playful. The front cover artwork presented Madonna leaning against a wall with an expression of "romantic loss or absorption." Designed as the Madonna album which would appeal to a larger audience in contrast to her previous records, Bedtime Stories and Erotica, the booklet featured red roses inside and a golden yellow flower on the back cover. According to The Guardian writer Caroline Sullivan who believed that Madonna removed her nose ring for the cover shot indicated she "wants the album to be taken on its own merits." In 2013, the artwork was dubbed as one of the "20 Most Fashionable Album Covers Ever" by the Dutch edition of Elle magazine. The title of the album derives from her 1990 song of the same name since it had received little attention during the release of its original album, I'm Breathless. 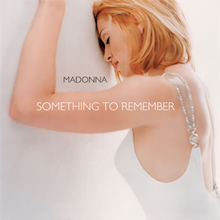 Something to Remember was released in some European countries on November 3, 1995. In Madonna's native country, the album was released on November 7, 1995. In Japan, the album was released under the title Best of Madonna: Ballad Collection on November 10, 1995, containing her 1986 song "La Isla Bonita" as a bonus track. "La Isla Bonita" was re-released three months prior the compilation as a double A-side record with "Human Nature", the final single from Bedtime Stories. Receiving gold certification from the Recording Industry Association of Japan (RIAJ), the song was added to Something to Remember track listing in the hope of boosting the album sales in the region. In Latin America, the album included the bonus track "Verás", the Spanish version of "You'll See". In 2001, WEA Records released a box set of Something to Remember and The Immaculate Collection to coincide with the release of Madonna's second greatest hits package, GHV2. Madonna performing "Oh Father" during the Blond Ambition World Tour. In Europe, it was released as the compilation's second single. "I Want You" was released as a promotional single from the album on October 2, 1995. It was originally intended as the album's first single, but cancelled due to contract problems between Madonna's label and Motown Records, the copyright owner of the song. The music video for the song was directed by Earle Sebastian and was nominated for the MTV Amour category at the MTV Europe Music Awards 1996. "You'll See" was released as the album's lead single on October 30, 1995. The song reached the top five position in Austria, Canada, Finland, Italy and the United Kingdom. The single managed to peak at number six on the Billboard Hot 100, making Madonna the third act in history (after Aretha Franklin and Marvin Gaye) to have a hit peak at each position from one to ten on the chart. An accompanying music video was directed by Michael Haussman as a sequel to Madonna's previous music video for "Take a Bow". "Oh Father" was released as the second single for European market on December 21, 1995. It became a top ten hit in Finland and achieved top 20 placement in the United Kingdom, but charted weakly in the rest of the continent, resulting a low peak of number 62 on the European Hot 100 Singles chart. "One More Chance" received a limited single release in Australia and several European countries on March 7, 1996. Despite no promotion and no music video, the song still charted as high as number two in Italy and peaked inside the top 40 in Australia, Finland, Sweden and the United Kingdom. "Love Don't Live Here Anymore" was released as the final single from the album on March 19, 1996. The song received poor commercial reception, peaking at number 78 on the Billboard Hot 100, while reaching the top forty in Australia and Canada. Its accompanying music video was directed in by Jean-Baptiste Mondino at the Confitería El Molino in Buenos Aires, Argentina, during Madonna's day off from filming Evita. It was shot in a single frame portraying Madonna in an empty suite of an abandoned hotel. Stephen Thomas Erlewine from AllMusic wrote that "Throughout the album, Madonna proves that she's a terrific singer whose voice has improved over the years." He added, "Not one of the tracks is second-rate, and the best songs on Something to Remember rank among the best pop music of the '80s and '90s". Neil Strauss of The New York Times felt all the songs on the album "cohere better than a greatest-hits package would" and "they tell a story of their own, of a voice and attitude that have hardened in the dozen years that have elapsed between the bubble-gum-chomping innocence of 1983's 'Crazy for You' and the tortured torch singing of the new 'You'll See'." Ken Tucker of Entertainment Weekly commented: "By placing her greatest-hit ballads ('Live to Tell', 'Crazy for You', 'Take a Bow', etc.) in a new context—that is, separated from her more attention-getting dance music—Madonna reinvigorates them, which is just what a good best-of compilation is supposed to do. The three new songs 'You'll See', 'One More Chance', and a wonderfully eerie version of Marvin Gaye's 'I Want You' are consumer enticements that just add to the allure." According to Greg Forman from The Post and Courier, the album shows that "There's an important difference between having a great voice and being a great singer. Whitney Houston or Mariah Carey can sing circles (and octaves) around the most famous woman on the planet, but Madonna, through sheer force of personality sells her slow numbers with a panache few modern singers can match." John Wirt from The Advocate said that the album shows that Madonna "can craft slow songs as effectively as she knocks out dance numbers" and found "an unaffected simplicity and sincerity" in her ballad singing. Writing for The Baltimore Sun, J. D. Considine believed that with the album "Madonna not only reminds us that there's more to her music than dance tunes, but also demonstrates that her voice is nowhere near as thin and chirpy as her detractors imagine." He further explained, "one of the most amazing things about the album is how sultry and assured she sounds ... The Madonna on display here not only has a richer, deeper voice than you imagined, but more interpretive insight as well." Alwyn W. Turner in the book The Rough Guide to Rock stated that the album features "the best of her slow pieces" displaying that "Madonna had evolved over the years into an excellent ballad singer." Edna Gundersen from USA Today said that the album "flaunts the less sizzling, though equally galvanizing, highlights of her career." She was mostly impressed with Madonna's vocal and emotional power on the track "You'll See" which became "the clearest proof that the ambitious blonde is more singer than celebrity." J. Randy Taraborrelli in his book Madonna: An Intimate Biography picked the David Foster produced tracks as standouts, saying "It was interesting that, with all of his [David Foster] exciting musical ability from which to draw, he and Madonna would come up with two of the most sombre songs she has ever recorded—but such is the excitement of collaboration; one never knows what will come of it." Tirzah Agassi from The Jerusalem Post said the arrangements on the new songs "show a great leap in sophistication" and felt that Madonna "has invested much in improving her vocal technique." Robert Christgau criticized the album giving it a "dud" rating, and indicating it as "a bad record whose details rarely merit further thought". Madonna performing Something to Remember's final single, "Love Don't Live Here Anymore", on the Rebel Heart Tour. In the United States, Something to Remember debuted and peaked at number six on the Billboard 200 chart on the issue date of November 25, 1995. It stayed on the chart for 34 weeks and was certified triple platinum by the Recording Industry Association of America (RIAA) for shipments of three million units. According to Nielsen SoundScan, the album has sold 2,102,000 copies as of December 2016. This figure does not include sales from clubs, such as BMG Music Club where the album sold an additional 179,000 copies. In Canada, the album entered the RPM Albums Chart at number two on November 20, 1995. The album held the top ten position for eight consecutive weeks before descending to number 12 on January 29, 1996. It stayed on the chart for 26 weeks, and was certified double platinum by the Music Canada (MC) for shipments of 200,000 copies. The album also performed well in other North American market such as Mexico, where it was certified platinum by Asociación Mexicana de Productores de Fonogramas y Videogramas (AMPROFON) for shipments of 250,000 copies. In the United Kingdom, Something to Remember debuted at number three on the UK Albums Chart on November 18, 1995. It dropped to number four in its second and third week, spending twelve consecutive weeks in the top ten before falling to number 11 on February 2, 1996. The album was certified triple platinum by the British Phonographic Industry (BPI) for shipments of 900,000 copies. In Germany, the album reached number two on the Media Control Charts for two weeks and was certified platinum by the Bundesverband Musikindustrie (BVMI) for shipping 500,000 copies. The album also reached the top ten of the charts in other European countries and peaked at number one in Austria, Finland and Italy, where it shipped more than 500,000 copies according to the Federazione Industria Musicale Italiana (FIMI). Its commercial success in the continent allowed the album to peak at number three on the European Top 100 Albums chart. It was certified triple platinum by the International Federation of the Phonographic Industry (IFPI) for selling over three million copies across Europe. The album was also well received commercially in Asia-Pacific territories. In Japan, the album peaked at number nine on the Oricon Albums Chart and was certified double platinum by the Recording Industry Association of Japan (RIAJ) for shipping 400,000 copies. In Australia, the album debuted at number two on November 19, 1995 and topped the record chart the following week. It stayed on the top 50 for 19 weeks and received quadruple platinum award from the Australian Recording Industry Association (ARIA) for shipments of 280,000 copies. It also became a top-ten album in New Zealand, peaking at number eight, and was certified platinum by the Recorded Music NZ (RMNZ) for shipments of 15,000 copies. Overall, the album has sold more than ten million copies worldwide. With the commercial success it achieved, Something to Remember set a trend of releasing ballad albums afterward, such as the 1996 albums Love Songs by Elton John and If We Fall in Love Tonight by Rod Stewart. 6. "This Used to Be My Playground"
^ Guccione Jr., Bob (January 1996). "Live to Tell". Spin. Spin Media LLC. 11 (10): 94. ISSN 0886-3032. Retrieved April 2, 2014. ^ "Voguepedia: Mario Testino". Vogue. Archived from the original on February 23, 2012. Retrieved March 8, 2014. ^ Sullivan, Caroline (November 10, 1995). "Pop CD Releases: Madonna 'Something to Remember' (Maverick)". The Guardian. p. T.016. ISSN 0261-3077. ^ "Zien! De 20 meest mödische albumcovers ever". Elle. Archived from the original on March 11, 2014. Retrieved March 6, 2014. ^ a b "Something to Remember (CD)" (in French). Amazon.com. Retrieved March 10, 2014. ^ a b "Something to Remember (CD)" (in German). Amazon.com. Retrieved March 10, 2014. ^ a b "Something to Remember (CD)" (in Italian). Amazon.com. Retrieved March 10, 2014. ^ a b c "Something to Remember". Amazon.com. Retrieved March 7, 2014. ^ a b "CD Madonna – Something to Remember". Submarino.com.br. Retrieved March 10, 2013. ^ "Immaculate Collection/Something to Remember". AllMusic. Rovi Corporation. Retrieved March 10, 2013. ^ "MTV Europe Music Awards Winners 1994–2000". Billboard. 113 (45): 50. November 10, 2001. ISSN 0006-2510. ^ "ultratop.be – Madonna – You'll See" (in Dutch). Ultratop 50. Hung Medien. Retrieved May 4, 2011. ^ "Eurochart Hot 100". Music & Media. 11 (3). January 20, 1996. OCLC 29800226. ^ a b "Madonna: Discografia Italiana". Hit Parade Italia. Federazione Industria Musicale Italiana. Retrieved May 31, 2010. ^ "Madonna - One More Chance" (in Finnish). FinnishCharts.com. Hung Medien. Retrieved March 10, 2014. ^ Bronson, Fred (October 25, 2003). "Madonna Hits 50 Songs". Billboard. 115 (43). ISSN 0006-2510. Retrieved September 21, 2010. ^ "Madonna – Love Don't Live Here Anymore (Remix) (Song)". Ultratop 50. Hung Medien. Retrieved September 21, 2010. ^ a b Wirt, John (November 24, 1995). "Meat Loaf's rock theater still in his Neighborhood". The Advocate. p. 7. ISSN 0001-8996. ^ a b Erlewine, Stephen Thomas. "Something to Remember > Review". AllMusic. Retrieved August 8, 2011. ^ a b Considine, J. D. (November 7, 1995). "Album review: The ballads of 'Something to Remember' remind us that there is a voice as well as an image". The Baltimore Sun. Retrieved March 7, 2014. ^ a b "CG: Madonna". Robert Christgau. Archived from the original on June 6, 2011. Retrieved August 8, 2011. ^ a b Tucker, Ken (November 24, 1995). "Something to Remember". Entertainment Weekly. Retrieved August 8, 2011. ^ a b Agassi, Tirzah (November 28, 1995). "Madonna sports a new, new look". The Jerusalem Post. p. 07. ISSN 0021-597X. ^ a b Strauss, Neil (November 5, 1995). "Madonna; 'Something to Remember' Maverick/Warner Brothers". The New York Times. Retrieved March 7, 2014. ^ a b Forman, Greg (November 23, 1995). "Is there life after thirty for today's female pop stars?". The Post and Courier. 2482 (38). p. 31. ^ a b Gundersen, Edna (October 17, 1996). "Pop/Rock Album Review: Something to Remember". USA Today. Retrieved March 7, 2014. ^ Buckley, Peter (2003). The Rough Guide to Rock. Rough Guides. p. 627. ISBN 978-1-84353-105-0. ^ "CG 90s: Key to Icons". Robert Christgau. Retrieved March 10, 2014. ^ "The Billboard 200: Week Ending November 25, 1995". Billboard. 107 (47). November 25, 1995. ISSN 0006-2510. Retrieved March 9, 2014. ^ a b "American album certifications – Madonna – Something to Remember". Recording Industry Association of America. Retrieved May 31, 2018. If necessary, click Advanced, then click Format, then select Album, then click SEARCH. ^ a b Trust, Gary (December 12, 2016). "Ask Billboard: Madonna's Career Album Sales". Billboard. Retrieved December 12, 2016. ^ a b David, Barry (February 18, 2003). "Shania, Backstreet, Britney, Eminem and Janet Top All-Time Sellers". Music Industry News Network. Archived from the original on September 3, 2009. Retrieved September 21, 2011. ^ a b "Top RPM Albums: Issue 2812". RPM. Library and Archives Canada. Retrieved April 8, 2016. ^ "Top RPM Albums: Issue 2871". RPM. January 29, 1996. Retrieved March 10, 2014. ^ a b "Canadian album certifications – Madonna – Something to Remember". Music Canada. Retrieved November 6, 2014. ^ a b "Madonna | Artist | Official Charts". UK Albums Chart. Retrieved April 8, 2016. ^ a b "British album certifications – Madonna – Something to Remember". British Phonographic Industry. Retrieved November 6, 2014. Select albums in the Format field. Select Platinum in the Certification field. Type Something to Remember in the "Search BPI Awards" field and then press Enter. ^ a b "Longplay-Chartverfolgung at Musicline" (in German). Musicline.de. Phononet GmbH. Retrieved April 8, 2016. ^ a b "Gold-/Platin-Datenbank (Madonna; 'Something to Remember')" (in German). Bundesverband Musikindustrie. Retrieved November 6, 2014. ^ a b c "Australiancharts.com – Madonna – Something to Remember". Hung Medien. Retrieved April 8, 2016. ^ "Italy: The Billboard Spotlight". Billboard. 109 (24): 57. June 14, 1997. ISSN 0006-2510. Retrieved March 9, 2014. ^ a b "Hits of the World". Billboard. 108 (10). March 9, 1996. ISSN 0006-2510. Retrieved March 9, 2014. ^ a b "IFPI Platinum Europe Awards – 1997". International Federation of the Phonographic Industry. Retrieved November 6, 2014. ^ a b "ARIA Charts – Accreditations – 1999 Albums". Australian Recording Industry Association. Retrieved November 6, 2014. ^ a b Scapolo, Dean (2007). The Complete New Zealand Music Charts 1966–2006 (Illustrated ed.). Maurienne House. ISBN 978-1-877443-00-8. ^ Sprague, David. "New Sets Offer 'Greatest Ballads'". Billboard: 15. ISSN 0006-2510. Retrieved March 9, 2014. ^ Something to Remember (Liner notes). Madonna. Maverick Records, Warner Bros. Records. 1996. 9 46100-2. ^ "Hits of the World". Billboard. 107 (51). December 23, 1995. ISSN 0006-2510. Retrieved March 9, 2014. ^ "Austriancharts.at – Madonna – Something to Remember" (in German). Hung Medien. Retrieved April 8, 2016. ^ "Ultratop.be – Madonna – Something to Remember" (in Dutch). Hung Medien. Retrieved April 8, 2016. ^ "Ultratop.be – Madonna – Something to Remember" (in French). Hung Medien. Retrieved April 8, 2016. ^ a b "Hits of the World". Billboard. 108 (8). February 24, 1996. ISSN 0006-2510. Retrieved March 9, 2014. ^ "Hits of the World". Billboard. 108 (5). February 3, 1996. ISSN 0006-2510. Retrieved March 9, 2014. ^ "Dutchcharts.nl – Madonna – Something to Remember" (in Dutch). Hung Medien. Retrieved April 8, 2016. ^ "Madonna: Something to Remember" (in Finnish). Musiikkituottajat – IFPI Finland. Retrieved April 8, 2016. ^ "Lescharts.com – Madonna – Something to Remember". Hung Medien. Retrieved April 8, 2016. ^ "Top 40 album DVD és válogatáslemez-lista – 1996. 5. hét" (in Hungarian). MAHASZ. Retrieved April 8, 2016. ^ "Hits of the World". Billboard. 107 (50). December 16, 1995. ISSN 0006-2510. Retrieved March 9, 2014. ^ "Charts.org.nz – Madonna – Something to Remember". Hung Medien. Retrieved April 8, 2016. ^ "Norwegiancharts.com – Madonna – Something to Remember". Hung Medien. Retrieved April 8, 2016. ^ "Official Scottish Albums Chart Top 100". Official Charts Company. Retrieved July 12, 2016. ^ "Swedishcharts.com – Madonna – Something to Remember". Hung Medien. Retrieved April 8, 2016. ^ "Swisscharts.com – Madonna – Something to Remember". Hung Medien. Retrieved April 8, 2016. ^ "Madonna Chart History (Billboard 200)". Billboard. Retrieved April 8, 2016. ^ "ARIA Charts – End Of Year Charts – Top 100 Albums 1995". Australian Recording Industry Association. Retrieved March 6, 2014. ^ "Jaaroverzichten 1995" (in Dutch). Ultratop. Hung Medien. Retrieved 2011-11-06. ^ "Rapports annuels 1995" (in French). Ultratop. Hung Medien. Retrieved 2011-11-06. ^ "RPM Top 100 Albums (CDs & Cassettes) of 1995". RPM. Retrieved March 6, 2014. ^ "Gli album più venduti del 1995". Hit Parade Italia. Federazione Industria Musicale Italiana. Retrieved March 10, 2014. ^ a b "End of Year Album Chart 1996". Official Charts Company. Retrieved March 10, 2014. ^ "ARIA Charts – End Of Year Charts – Top 100 Albums 1996". Australian Recording Industry Association. Retrieved March 6, 2014. ^ "Jahreshitparade 1996" (in German). Ö3 Austria Top 40. Hung Medien. Retrieved March 6, 2014. ^ "Jaaroverzichten – Album 1996" (in Dutch). MegaCharts 100. Hung Medien. Retrieved March 6, 2014. ^ "Top 100 Album-Jahrescharts" (in German). GfK Entertainment. Retrieved 24 August 2015. ^ "1996年 アルバム年間TOP100" [Oricon Year-end Albums Chart of 1996] (in Japanese). Retrieved 2011-01-01. ^ "Schweizer Jahreshitparade 1996" (in German). Swiss Music Charts. Hung Medien. Retrieved March 6, 2014. ^ "1996 The Year in Music: Top Billboard 200 Albums". Billboard. 108 (52). December 28, 1996. ISSN 0006-2510. Retrieved March 6, 2014. ^ "Argentinian album certifications – Madonna – Something to Remember" (in Spanish). CAPIF. Archived from the original on July 6, 2011. ^ "Austrian album certifications – Madonna – Something to Remember" (in German). IFPI Austria. Retrieved March 9, 2014. Enter Madonna in the field Interpret. Enter Something to Remember in the field Titel. Select album in the field Format. Click Suchen. ^ "Ultratop − Goud en Platina – albums 1996". Ultratop. Hung Medien. Retrieved May 31, 2018. ^ "Brazilian album certifications – Madonna – Something to Remember" (in Portuguese). Associação Brasileira dos Produtores de Discos. Retrieved March 9, 2014. ^ a b "Madonna" (in Finnish). Musiikkituottajat – IFPI Finland. Retrieved March 9, 2014. ^ "French album certifications – Madonna – Something to Remember" (in French). Syndicat National de l'Édition Phonographique. Retrieved March 9, 2014. ^ "Dutch album certifications – Madonna – Something to Remember" (in Dutch). Nederlandse Vereniging van Producenten en Importeurs van beeld- en geluidsdragers. Retrieved July 31, 2018. Enter Something to Remember in the "Artiest of titel" box. ^ "Polish album certifications – Madonna – Something to Remember" (in Polish). Polish Society of the Phonographic Industry. Retrieved March 9, 2014. ^ "Mi2N: Music Divas & Rock Bands Top South African Certifications". Music Industry News Network. May 2, 2002. Retrieved August 9, 2015. ^ "Guld- och Platinacertifikat − År 1987−1998" (PDF) (in Swedish). IFPI Sweden. Retrieved March 9, 2014. ^ "The Official Swiss Charts and Music Community: Awards (Madonna; 'Something to Remember')". IFPI Switzerland. Hung Medien. Retrieved March 9, 2014. ^ "Something to Remember (Cassette)" (in French). Amazon.com. Retrieved March 10, 2014. ^ "Something to Remember (Cassette)" (in German). Amazon.com. Retrieved March 10, 2014. ^ "Something to Remember (CD)". Amazon.com. Retrieved March 10, 2014. ^ "Something to Remember (Cassette)". Amazon.com. Retrieved March 10, 2014. ^ "Something to Remember (Vinyl LP)" (in German). Amazon.com. Retrieved March 10, 2014. ^ "Something to Remember (Vinyl)". Amazon.com. Retrieved March 10, 2014. Salaverri, Fernando (2005). Sólo éxitos: año a año, 1959–2002. Spain: Fundación Autor-SGAE. ISBN 978-84-8048-639-2. Taraborrelli, Randy J. (2002). Madonna: An Intimate Biography. Simon & Schuster. ISBN 978-0-7432-2709-4. Whitburn, Joel (2010). Joel Whitburn's Top Pop Singles, 1955–2008. Record Research. ISBN 978-0-89820-180-2.